Terex Cranes has introduced the Terex CTT 472-20, a flat top tower crane that expands the maximum jib length for the OEM’s 20-tonne class to 80m, and allows a maximum load at the full length of the jib tip of four tonnes, alongside greater load charts than previous models along its length. With a 470 tonne-meter load moment, the CTT 472-20 crane delivers high lift capacities throughout its load chart and can be assembled in 11 different jib configurations from 30m in length through to 80m to meet varying jobsite needs. “Fresh off the introduction of a new hammerhead tower crane at CONEXPO, the CTT 472-20, is a versatile and robust flat top tower crane requested by our customers. 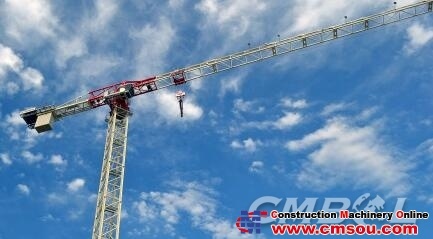 It provides a flexible solution to complex lifting challenges,” says Marco Gentilini, VP and GM for Terex Tower Cranes. The model is the first tower crane by Terex with the cabin that it will now be installing on all of its flat top, hammerhead and luffing jib models, with a fully adjustable seat and an anti-glare control screen. The control system on the CTT 472-20 meanwhile features the Terex Power Plus function that can temporary increase the maximum load moment under controlled conditions (e.g. smooth hoist movements) to give the operator up to 10% extra lifting capacity when needed. Contractors or fleet operators can also configure the crane with either H20, HD23 or TS212 Terex mast sections, or with a combination of all three – by means of transfer masts. The CTT 472-20 is also optimised for transport an erection, with tower segments come preassembled with aluminum ladders for fast erection and increased durability, while the jib sections come preassembled life lines and galvanized walkways for quick, safe installation at height.